The Skyland Games crew has been busy these last few weeks! 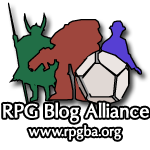 Mike and Kevin attended North Texas RPG con, which we will likely need to write a longer recap about later, but here is my tiny review: if you go to cons for the gaming, NTRPGcon is definitely worth the trip! Saturday was also Free RPG Day, which marks the 4th anniversary of pretty much the best FLGS of the modern era: The Wyvern’s Tale. Mike and Kevin ran a table of both Mutant Crawl Classics and Lankhmar each, and an awesome time was had by all. But on to to the main event for this blog. I picked up several awesome souvenirs from NTRPGcon, most of which we’ll be reviewing here. The latest DCC module came out that weekend, and it is not to be missed! If you plan on playing this adventure instead of running it, you may want to stop reading now. The review will contain some spoilers! 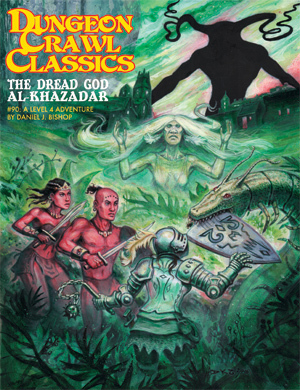 The Dread God Al-Khazadar is a 24 page module that starts in the famed city of Punjar (could be any city really…Lankhmar?) but quickly the party is transported to an entirely different world. Once there, the party encounter Zardu and Zarya, two natives who may be used to provide information about the world, function as replacement PCs, or in an appendix-N-themed style, love interests for PCs. The author includes some mechanics like +1d when defending their true love and possibly losing luck points if separated from them. This could encourage some really interesting role-play during the adventure and is unique to this module. There are a lot of great new creatures and side-bars that detail different aspects of the world, including a hex-map in the inside cover that shows various details of the region and would allow for several sessions worth of material. I would not recommend this one for a single 4-5 hour convention slot, as you would have to make so many edits, it would feel rushed and wouldn’t do the source material justice. This could have easily been expanded into a boxed set in its own right like Chained Coffin and Purple Planet. In the hands of the right Judge, it could be mini-campaign. My favorite aspect of this adventure is the end. It is a bit of a twist and a very compelling choice that actually made my jaw drop when I read it. No spoilers on this, but just know that your players will be talking about this adventure for a long time, no matter what they choose! I own nearly all the DCC adventures and this has probably been my favorite read since Fate’s Fell Hand. This is a must-own adventure. Daniel J. Bishop knocked it out of the park!